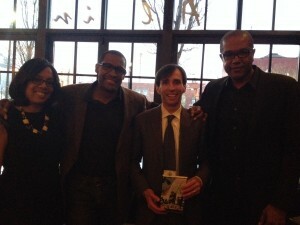 Sharon Epperson, Alvin Clayton, Noam (with autographed copy! ), and author Chris Farley. New Rochelle resident Chris Farley has just published his first novel, Gameworld. It’s a fantasy for middle-schoolers and young adults, and instead of drawing on the genre’s usual medieval European influences, Gameworld delves instead into Jamaican myths and folks tales. The book has received quite a bit of attention, including a recent segment on the Today Show. In this interview, you can hear Chris talk about how his own kids helped inform his writing – and also about some of his interesting experiences as a columnist.